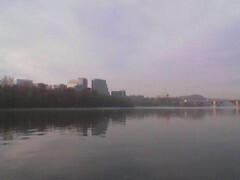 A very thin, low fog hugs Theodore Roosevelt Island, dissipating as the Potomac River warms up in morning light. Yeah what was the deal with all that fog for the past two days. I thought is was too cold for that to happen. I sure made the ride home spooky!